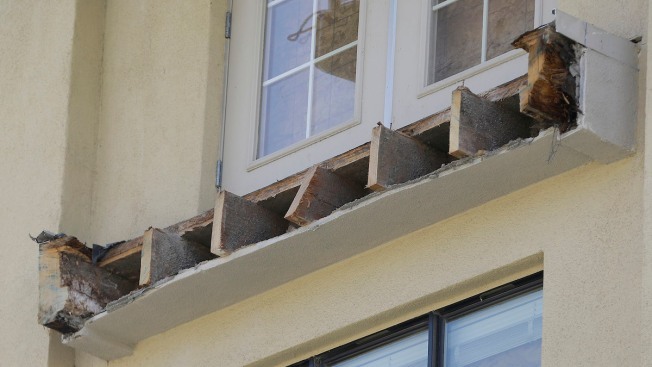 The remaining wood beams of an apartment building balcony that was removed below a balcony that collapsed is shown is shown in Berkeley, Calif., Thursday, June 18, 2015. A state agency is seeking to revoke the contractor license for the builders of the Berkeley complex where a rotting balcony collapsed and killed six people last year, concluding that the builders ignored specifications that the structure be supported with beams treated against wood rot. The Contractors State License Board is attempting to revoke the license of Pleasanton-based Segue Construction Inc. the general contractor for the Library Gardens at 2020 Kittredge Street. That’s where six people were killed and seven injured in the June 16, 2015, balcony collapse. Five of those killed were Irish students attending a birthday party. According to the charges lodged Tuesday by the license board, the accused firm “willfully departed from or disregarded the plans or specifications,” without the owner’s consent in constructing the 176-unit complex completed in 2007. The third and fourth floor balconies at the center of the probe were constructed in late 2005, but the contractors who did the work allegedly failed to heed plan requirements that they build the structure out of pressure-treated joists that resist rot. “The micro-lam floor joists installed on the cantilever balcony for unit 405 were not pressure treated,” the charges allege. The board says builders also failed to heed specifications by using a type of engineered material known as oriented strand board. The board describes the boards as “not an acceptable” decking floor material. Investigators determined that the oriented strand board deteriorated after getting wet due to improper waterproofing. The board says between the time the balcony was constructed in 2005, and final waterproofing in 2006, Berkeley received some 38 inches of rainfall, saturating the vulnerable wood material. The charges allege that the wood structures were not properly protected against rain over that period. Segue’s license is set to expire next year. It has 15 days to appeal the action. While prosecutors said there was not sufficient evidence to bring criminal charges against the contractors, the deaths resulted in legislation that required improved tracking of court judgments against contractors. The Segue firm had paid out $26 million in prior court settlements related to water infiltration problems on its projects, yet the license board was not aware of its track record because such settlements are often protected by confidentiality agreements. Intial calls to Segue for comment were not returned.